Want to store your files online but don’t want to use Dropbox or Google Drive because of you think they are too mainstream? You can try pCloud. It is a nice cloud storage service for out-out-the-box people like you. What makes it different? As a cloud storage service, the main function of pCloud remains the same as Dropbox and other similar services. It allows you to store your files on the internet and access them across devices. pCloud has a feature that is not offered by both Dropbox and Google Drive. It’s a built-in audio player. The feature allows you to play audio files directly from the pCloud dashboard. You can even create playlists. To check out how great pCloud is, let’s take a deeper investigation over it. Firstly, let’s figure out how spacious pCloud gives you free storage space. In terms of free storage capacity, pCloud stands in the middle between two most popular cloud storage services, Dropbox and Google Drive. It offers more free space than Dropbox does, but still fewer than Google Drive. In Dropbox, you will only get a 2GB of free storage, while Google Drive gives a 15GB of free storage. In pCloud, you will get a 10GB of free storage space. You can use the free storage space to store any type of file, regardless the size. If you wish it, you can even use pCloud to store your HD video collections. Just be wise if you want to use pCloud as a file-sharing medium. You have a monthly download link traffic per month. The amount is 50GB. For instance, if you have a HD video on pCloud with file size of 1GB and share the link publicly, it will only be able to be downloaded 50 times. In order to allow you managing your files, cloud storage services also feature an online file manager. Sure, pCloud also has one. The file manager of pCloud is similar to Dropbox in some ways. For example, it comes with a turquoise folder icon. An Upload button lies above the folders, with a folder button next to it. You can use the button to create a new folder. 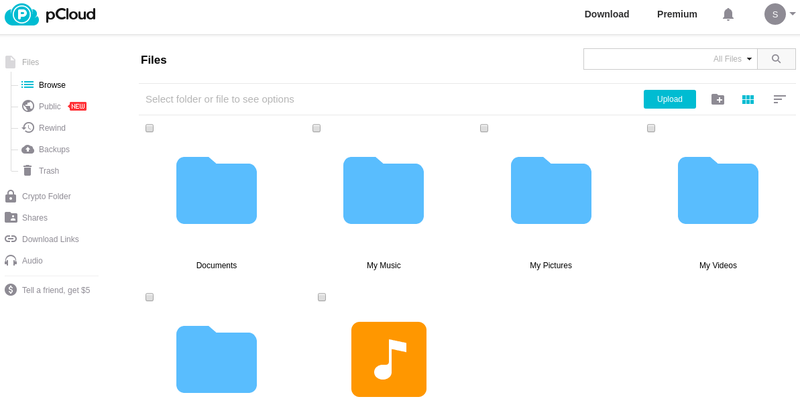 If you have a bunch of files and folders, pCloud makes it easy for you to find ones. You can sort the files and folder by name and modification date. There is also a handy search box to make everything even easier. By default, the file manager of pCloud displays your files and folders in a list mode, you can change it to a grid mode if you want it. At the side panel, you can see several links to access pCloud features. Upload manager feature is crucial enough for a cloud storage service. You will find how crucial this feature is when you are uploading large files. It would not be funny to stay on the same page only to wait the uploading process is done. When you press the Upload button on pCloud to upload new files, an upload manager will appear as a pop-up window. Through this window, you can select files and see the uploading progress. Unless you are the one who love to see a progress bar, you can minimize this window to work on other tasks. You can go another pages within pCloud dashboard while keeping an eye of the progress bar of the uploading process at bottom-right corner of your screen. As I said at the beginning of this article, pCloud has a built-in feature to allow you playing audio files directly from the pCloud dashboard. If you use pCloud to store photos, you can also preview them. When previewing an image file, you can also see a slideshow button. Up here, it seems there is no problem about pCLoud capabilities of treating your files. You can do much things just like you can do on your computer. Unfortunately, pCloud is not too good when it comes to treating document files. All you can do with your document files stored on pCloud is just previewing them. Not all document formats can be previewed. When you click on a Markdown file with the aim to preview it, instead of displaying the content, pCloud will download the file. The document formats that can be previewed with pCloud amongst other are Microsoft Word (DOCX) and OpenDocument (ODT). As a comparison, Dropbox has capability to open and edit the document formats mentioned above (DOCX and ODT) as it has integrated its service with Office Online. All cloud storage services has transformed from a mere service to store files online to a collaboration tool. pCLoud also offers the same capability. 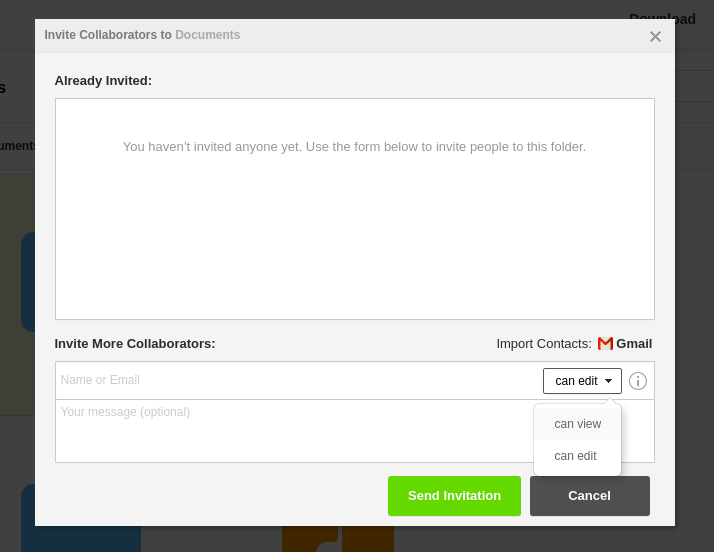 You can invite your team members to join a certain folder. When inviting, you can also set the permission whether you let your team members to make editing or just viewing the folder contents. There is no problem with pCloud in terms of collaboration. It’s capable enough. Just like most online services, pCloud also uses the freemium business model. While you can use it for free, paid version is also available if you need more features and capabilities. pCloud offers two paid packages: Premium and Premium Plus. In addition to additional storage capacity, paid packages also offers more features like password protection when sharing a file via link, expiration date of links, longer trash history and so on. Following is comparison table between pCloud free, pCloud Premium and pCloud Premium Plus. What makes pCloud interesting for business is the offered buying options. While similar services like Dropbox and Google Drive offer only duration-based packages (monthly and yearly subscription), pCloud also offers a lifetime package with one-time payment. Choosing this package you don’t need to spend monthly/yearly budget. Looks more expensive at first, but it is a good option for a long term. For payment options, pCloud accepts PayPal, credit cards and bank transfer. Much more flexible then, for instance, Google Drive. To secure your files, pCloud offers a feature called pCloud Crypto. It is a paid feature that provides client-side encryption. To use this feature you have to spend $4 per month. What if you are not subscribed to this feature? pCloud has a good responsibility. Regardless of what type of account you have at pCloud, your files are secured using 256-bit AES method of encrypting during and after transfer. In addition, pCloud also applies TLS/SSL channel protection upon transfer. PCloud doesn’t only offer security feature to prevent your files from being hijacked. It also protects your files from potential hardware failure. After your data is uploaded onto the pCloud servers, pCloud keeps 5 copies on at least three server locations in a highly secure data storage center. This way, the potential of you are losing your files is much smaller. pCloud is superior in terms of client app availability. pCloud provides client apps for major platforms, be it mobile and desktop. The platforms that are supported by pCloud are Linux, macOS, Windows, Android and iOS. You will need the pCloud client app regarding the syncing process. By installing pCloud client app, you can access your files from any device. Not limited to a single device thanks to the sync feature. pCloud might has no as big name as Dropbox or Google Drive. However, it doesn’t this mean this cloud storage service being inferior. Regardless of its lack capability of treating document files, pCloud comes with comparable features and capabilities to the more popular names like Dropbox, Google Drive or OneDrive. Plus, it also offers client apps for all major platforms. If you are looking for a cloud storage service that offers spacious free storage capacity, pCloud is a better option than Dropbox and OneDrive. Once again, the downside of pCloud is that it has no decent tools to treat document files. Dropbox has integrated its service with Office Online (it also has Dropbox Paper), Google Drive has an integration with Google Docs. OneDrive is owned by Microsoft so there is no problem to open document files. However, if this doesn’t matter to you since you only need to store your files instead of editing documents, then pCloud is great for you. Previous articleWhat is a NEF File and How to Open it?